Get a ballpark figure for the potential market value of what you can grow in the space available to you. 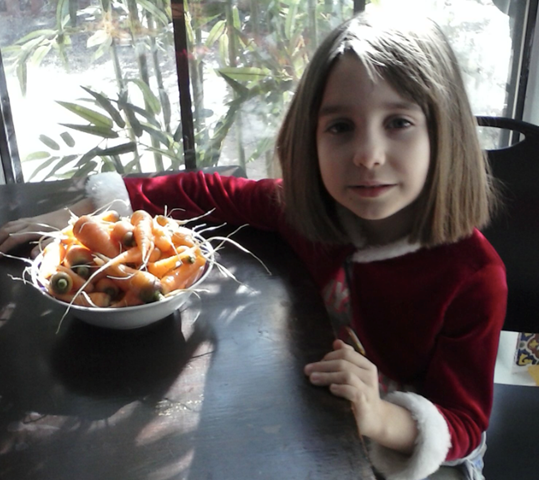 But keep in mind that some things like digging delicious winter carrots in December are just one of many gifts of gardening that are priceless. Another Urban Garden is a program that Loving Garland Green is currently developing to support our goal of increasing the number of urban gardens in Garland. Record-keeping is an important part of this program for a number of reasons: First of all, by writing it down, the urban gardener can reflect better on what worked and what didn't in their garden. Then next year, they can plan better. I've found that what grows in a friend's garden who lives only a few houses away will not necessarily grow in my garden. This is another reason why I value seed saving. In my garden, this year's okra, marigolds, cantaloupe, and tomato seeds will all come from plants that I successfully grew in my garden in 2013. 1. Determine the total square footage of your urban garden. If you have several raised beds, determine the square footage of each raised bed and add them all together for the total. If you have one large area that you plan to use, measure its width and length in feet, then multiply the width by the length for total square footage. As a benchmark: Consider that Rosalind Creasy, author of "Edible Landscaping", from April through September of 2008 grew $700 worth of food in 100 square feet. Because my urban garden is almost five times that of Ms. Creasy's I estimate my potential at approximately $3,000 for my garden. 2. Take inventory of what you already have planted in your garden space and what you plan to plant there. For an example, view the PDF of an inventory taken by a member of Loving Garland Green of her urban garden. 4. Complete your record sheets at least weekly. During harvest season, weigh and record the results each time you take food from your garden.